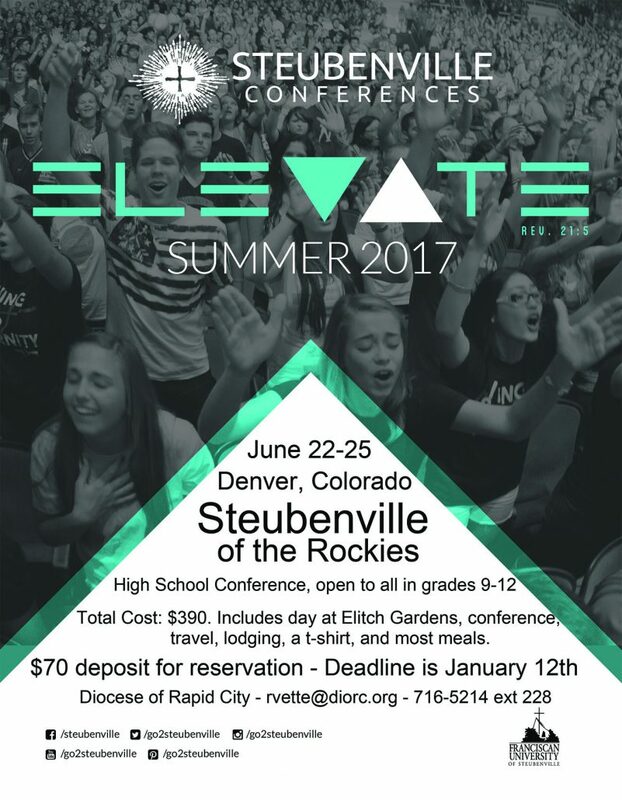 Click here to learn more about Steubenville of the Rockies. The event is hosted by the Archdiocese of Denver. Randy Vette — RVette@diorc.org, 605-716-5214 ext 228. Have you ever wondered what the Bishop’s Luncheon at the Cathedral of Our Lady of Perpetual Help is all about? Once a month, during the school year, students at the Newman Center plan and put together the luncheon for the bishop’s Mass. As a fundraiser for the center, all the proceeds assist our students in registration fees and travel expenses to the Fellowship of Catholic University Students conference that occurs every other year. citydiocese.org — to verify the date. It begins with Mass at 11:15 a.m. and lunch is served at noon. Bishop speaks from 12:30-1 p.m. Cost for meal is $6. The FOCUS conference, according to the website, helps college students strive “to live the Catholic faith in the midst of the secular world.” We hear from speakers who encourage and challenge us. The conference is five days long with more than eight thousand college students attending from around the United States. 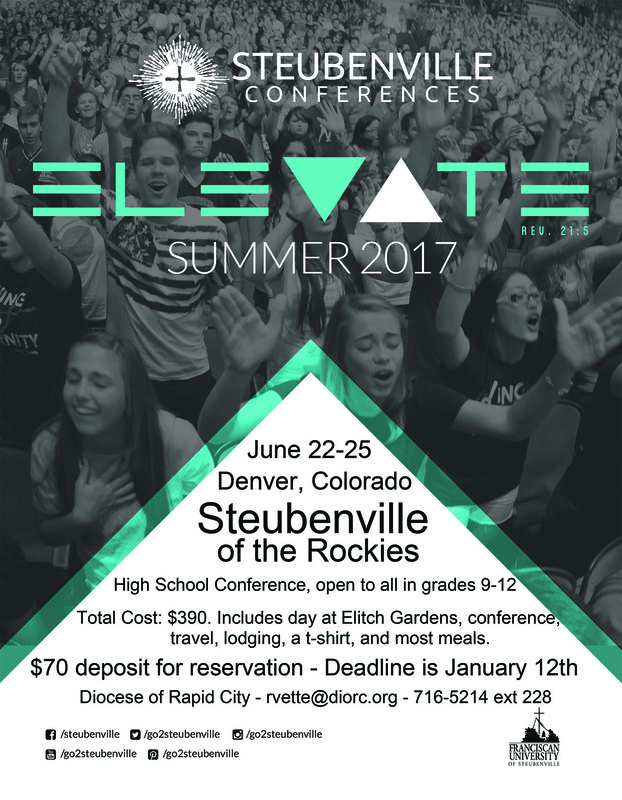 The conference offers fabulous speakers, amazing worship and great artists. All topics are geared to impact our young adults. The Newman Center students encourage you to attend the Bishop’s Mass and Luncheon. It will brighten your day as our university students from the Newman Center serve you. In 1916, with a donation of $750 from a woman named Elizabeth, a frame church was built called St. Elizabeth. The church was built next to a meetinghouse that previously served as the church. Parishioners traveled by horse and wagon and camped the night before and to attend the monthly 8 a.m., Mass and breakfast. The following year, strong winds blew so hard the church was blown part way off its foundation but left the church intact — even the statue of the Sacred Heart did not move. By 1962, the church was too small for the congregation. The building was moved north of the new highway, and was used as a meeting hall. St. Anne Church from Red Bear Camp was moved 24 miles and placed next to the St. Elizabeth Church meeting hall. In order to move St. Anne Church, the tower had to be removed. The inside of the church was torn out including the high peaked roof and choir loft leaving only the outside shell. Local Lakota families did the work — adding sheet rock on the walls and ceiling and constructing a flat 11-foot ceiling. Due to the narrowness of the church, the altar was placed in the center against the sidewall with the pews facing each other on each side allowing everyone to see what was happening on the altar. The paintings on the inside of the church were Lakota Catholic. The tipi told the story of creation with night and day, rain and snow, and rainbow. The thunderbolts gave power to the thunderbird for war and peace symbolized with the arrowhead and pine bough. The buffalo was the Indian’s way of life giving food, implements, weapons clothes and coverings for tents. The horse depicted their transportation. Man alone is missing. Another image was the water bird. The bird comes down through the black chaos and the water to scoop up the earth to take it to the Great Spirit — man made out of the slime of the earth. The story represents God the Father. A cross represents God the Son. The twelve tongues of fire represents the Holy Spirit. The Blessed Trinity is in the work of creation, redemption and sanctification. A parishioner tanned a deer hide for the antependium, and also did the beadwork on the antependium with the words WAKAN (Holy), and the white elk skin tabernacle veil with beaded trim design. Other additions included a steeple in 1983, and in 1985 a parish hall was built called St. Elizabeth Hall dedicated to the memory of the St. Mary and St. Joseph societies. In 1999 a tornado destroyed the church, meeting hall, and trailers for the sisters and brothers living there and serving the church. Shortly after the tragedy, then-Bishop Blase Cupich sent a letter to all parishes in the diocese asking that a special collection be taken up to help rebuild. Br. Denny Hall was the first building re-built with the help of the Mennonite Church. This building served as a place of worship and meeting hall until the church and Br. Rene Hall were built. Funds for the new parish included a grant from the Catholic Extension and a check from the diocesan collection for $80,653.42. Parishioners were part of the designing and planning of the church. The circular shape for the Circle of Life — windows facing the east to greet the day and windows facing the cemetery where their ancestors are buried — are just a few of the elements in the present church. A few items survived the tornado: the deer hide antependium was badly water damaged, the beadwork was cut off and sewed onto new hide, and the altar remains the same. A four-and-a-half foot wood carving of the Holy Family with native features, which was just 6 years old, also survived the devastation. Two years later, on June 2, 2001, Bishop Cupich dedicated the new parish. On September 18, parishioners celebrated the 100th anniversary of the church with a blessing, prayer and song at the former site, followed by a short walk to the new church to continue the Sunday Mass ending with a final prayer and blessing outside. Fathers Tom Lawler, SJ, (Provincial Superior of the Wisconsin Province of the Society of Jesus), Joseph Daoust, SJ, (Sacramental Priest) and George Winzenburg, SJ, (president of Red Cloud Indian School) were the concelebrants. Three elders who had prayed in the old St. Elizabeth Church, Elizabeth Makes Him First, Mary Merrival, and Catherine Looking Elk brought up the gifts at Mass. diaconate and consecrated life through prayer and education. In our diocesan priority plan, under the foundational ministries of Vocations and Evangelization, Bishop Robert Gruss speaks about dioceses in the United States where vocations are flourishing. In these places, he says, “There resides a culture that has created an environment for young men and women to view the priesthood and religious life as a viable way of life and to view sacramental marriage as a vocation centered in Christ. Such an environment has, in some way, awakened the hearts of these young people. (Through Him, With Him and In Him, p. 121). One of the goals in the pastoral priority plan, under Vocations and Evangelization, is that each parish or parish grouping will form a vocation committee to encourage and promote a culture of vocations. It is within this environment young men and women will be emboldened to pray and to discern God’s plan and desire for them in more intentional ways, and it will be an environment in which parish communities will take it upon themselves to fervently pray for a vocation boom — not only in their own parishes, but in the entire Diocese of Rapid City as well. Jesus said to his disciples “The harvest is abundant but the laborers are few; beg the master of the harvest to send out laborers to gather his harvest” (Mt 9:36-38). We should pray fervently, pleading to Jesus constantly and relentlessly, to send more priestly and religious vocations to our diocese. I am not sure how well we do this in our parishes and in the diocese as a whole. Every weekend at parish Masses throughout the diocese we pray the vocation prayer, but has it become too rote for us? Do we just say the prayer instead of truly praying the prayer? Do we pray the vocation prayer and leave it at that? There is an amazing story of a village in northern Italy called Lu. From this village, with a population of about 1,800, has come 323 vocations: 152 priests and male religious and 171 nuns belonging to 41 different congregations. In 1881, the mothers of Lu made a decision that literally changed the face of this village community and its families forever. become a religious sister, placing their lives completely in God’s service. The mothers of Lu, under the direction of their parish priest, Msgr. Alessandro Canora, would gather every Tuesday for adoration of the Blessed Sacrament asking the Lord for vocations. Through their trusting and confident prayers, the mothers of Lu inspired other parents to pray for the same desire for their children. Together they created an atmosphere, an environment, a culture of vocations and of deep joy, which made it much easier for their children to pray, discern and recognize their own vocations. This environment inspired them to lay down their own lives at the service of God’s plan. desire and petition for vocations to priesthood and religious life. Right now, the Cathedral of the Holy Spirit has eight seminarians studying for the priesthood for the Diocese of Bismarck alone. Msgr. Richter said that there has been a group of parishioners that has been meeting every Tuesday for the last 20 years for adoration and rosary, praying fervently for vocations to the priesthood and religious life. As Msgr. Richter reflects on this phenomenon of having eight seminarians from one parish, he says it has to do with an environment, a culture where vibrant faith is experienced and lived out on a daily basis. He shared that they have 150 to 200 people who attend daily Mass. The priests in the parish offer over nine hours of confession weekly, plus 55 hours of adoration. These things are setting this parish on fire — a fire that is contagious to those who experience such a vibrant faith. As we put our diocesan priority plan into action, perhaps in our parishes across the diocese there will be mothers, fathers, families and parishioners inspired to gather in front of the Blessed Sacrament with the firm desire — a firm intention — to pray for vocations to priesthood and religious life. May the Lord lead them with wisdom into creating a strong culture of vocations in their homes and parishes, and may our diocese be the next diocese where vocations to priesthood and religious life are flourishing and booming. By the time most of you will have read this, the Jubilee Year of Mercy will have come to an end and the 2016 Presidential Election will be over. Now what? Where do we go from here? What is next? What a wonderful Jubilee of Mercy it has been. I recall the words of Pope Francis when he first informed the world of the Year of Mercy: “It is indeed my wish that the Jubilee be a living experience of the closeness of the Father, whose tenderness is almost tangible, so that the faith of every believer may be strengthened and thus testimony to be ever more effective.” It is my hope and prayer that the Holy Father’s wish has become a reality all across the world. It is the experience of mercy, both received and given away, that will bring true peace and harmony. So where do we go from here as the Jubilee of Mercy ends? This Jubilee has raised awareness for us of mercy being at the heart of the church’s mission. Proclaiming and living the mercy of God is at the heart of the church’s identity and where she is most credible and authentic. Therefore, though the official Jubilee of Mercy has ended, the clarion call to continue the works of mercy continues because it is at the heart of Catholic identity. This is the reason why both mercy and solidarity were specifically included as core values in the Diocesan Priority Plan. We will always be called to “be merciful, just as our Father is merciful” (Lk 6:36). As I wrote in Through Him, With Him, and In Him,’ “To be in solidarity with others is to see them as God sees them, to love them as God loves them, and to sacrifice for them as Christ has sacrificed for them. United together, we are the body of Christ. Every time we neglect others in the body, the whole body suffers (cf. 1 Cor 12:26). When we live in solidarity and charity, (and share mercy) the Body of Christ is built up, there is communion, and the kingdom of God is made manifest.” Continuing to seek ways in which these values are lived out among us allows us to more fully embrace our true identity. As I write this monthly column the presidential election is pending and I find myself still quite concerned about our country regardless of which candidate wins. The threats to human life and religious liberty remain, here and around the world. The threats to traditional marriage and family values are on the rise. The number of people living in poverty remains. Immigration issues, healthcare issues, the national debt issue all remain. The threat of violence from terrorism remains. The rise of secularism continues. A new face in the White House doesn’t change these realities. So where do we go from here? Recent polls show that more than 70 percent of the people surveyed believe our nation is on the wrong track. How do we get the nation back on the right track? What is the right track? There are probably as many different answers as the number of people polled. I would propose that the right track is a Catholic world view. What is it? The world view when this country was founded was from Judeo-Christian values brought from a Christian Europe. A world view is a lens through which we look at everything in life. It informs our laws and policies. It helps determine how we think and act in all situations and circumstances. An individual may not even be aware of having a world view. The Catholic world view is the view of the world and our response to it that has been given to us by Jesus Christ through his church. It is not something man-made, but given to us by God — revealed to us. The Catholic world view has its foundation in the Biblical world view — the world seen through the lens of divine revelation, the divine and living Word of God. Many people today have a world view that is informed by things other than our Catholic faith, i.e. by secularism, by a culture that is profoundly un-Christian and becoming even anti-Christian. Intentionally or unintentionally, many Catholics have rejected the world view given to us by God’s revelation. Catholics make up the largest Christian denomination in the world. Therefore, one would think that Catholics in numbers could have a profound impact in helping to shape and transform our culture. There would be great power to change the world if Catholics wholeheartedly embraced the revelation given us by Christ in his church. Dr. Ralph Martin in a talk entitled “The Attack on Religious Liberty and the Catholic Church: The Spiritual Dynamics and Our Role” quoted noted scripture scholar Father Francis Martin: “The root sin of the world is the refusal to believe in Jesus and the place he holds next to the Father as the revelation of the Father. The root sin is to reject the truth.” And then he quoted John 3:36, Whoever believes in the son has eternal life. Whoever disobeys the son will not see life but must endure God’s wrath. The wrath of God is not God getting angry at people, but is our experience of God’s holiness when we’re rejecting it. It’s the anguish of soul and the darkness of mind that comes when we say no to the testimony that God is giving to his Son. This is perhaps the situation in our world today. We need a Catholic world view if we are to live as Jesus’ disciples and become the people whom God created us to be, our true authentic selves. This call leads to seeking our personal vocation and mission in and for the world. We can’t transform the culture if we’ve accepted the secular world’s distorted world view. Unless we receive and accept all that has been given us through the church, we cannot be powerful witnesses in the world. There is no doctrine revealed that is not part of the Gospel message. We have a duty to live it all and share it. According to the Priority Plan, renewed efforts in religious formation for all ages lay a firm foundation for Catholics to grow in their union with Christ, to obtain adequate knowledge of the Catholic world view and to develop the necessary skills to be able to carry on the work of Christ in the world, each in one’s own way. Evangelization is the duty and responsibility of all baptized Catholics. Evangelization shares the Catholic world view and will lead others to true faith, living under the Lordship of Jesus Christ and the Catholic Church rather than under the deceitfulness of the Evil One. So, that’s where we go from here! The Diocesan Priority Plan — What is happening? Actually, much of the work has already begun. Many plan-directed activities are happening. Over the coming months, this space will outline some of those activities. Prayer is always a great place to start. Therefore, in addition to encouraging everyone to read the book, pastors are now including an intention in the Prayers of the Faithful (Universal Prayer) each Sunday for some aspect of the plan. Have you noticed? The goals in the Diocesan Priority Plan included due dates. Who is going to make sure that the plans are moving forward? Are we supposed to be doing something? Pastoral Planning is a living work, and it relies on the human efforts of many people. The process has to allow for some adjustment when the situation shifts. Already we are seeing some shifts, although the movement is always forward toward a goal. The first due date for a goal in the plan was the formation of a liturgy commission, which was originally slated for completion by September 1 (pp. 104-108). Background: Our Office of Worship has been a one-man operation for many years. Fr. Michel Mulloy has served as the director of the office since 1994, working alone for most of that time. After the goals for Sacraments and Worship were published, he was reassigned from the cathedral to McLaughlin. The move and settling into a new parish community required him to focus on pastoral matters this summer. The commission will need to be carefully selected. Those who serve will need to be able to give of time and attention to this work. They need to be open to the working of the Holy Spirit and to the authority of the Church. They need to be able to approach this work without a preconceived agenda. The members will be asked to travel for meetings and to serve for a number of years. The selection of commission members is well under way. Pastors have nominated parishioners to serve on the diocesan liturgical commission. Father Mulloy has reviewed the nominations and made his recommendations to the Bishop. Membership will be established by November 30, when meetings will begin to charter the Diocesan Liturgical Commission. All this is to be completed by March 30, 2017. Among the first tasks of the Liturgical Commission will be to consult parishioners about their experience of Mass in their parishes. The delay in establishing the Commission necessitated the adjustment of this goal (p. 108). The new due date for this goal is October 30, 2017. That will allow time for the Commission to research and develop the process for consultation and assessment of current liturgical practices, to communicate the plan for assessment to the diocese, conduct the survey and tabulate results for the Bishop for further communication. While all of that is going on at the diocesan level, each of us can participate by spending some time reflecting on our own encounter with Jesus Christ in the sacraments and by making an extra effort to be engaged in prayer, especially when we are at Mass. As Bishop Gruss reminds us in his pastoral letter, “Full, conscious and active participation in our liturgical celebrations is foundational to this encounter. As we are transformed by what we celebrate, so we become more fully the Body of Christ, the Church” (p. 108). Identify areas where reconciliation and unity are strong and areas where reconciliation is needed for each parish or group of parishes by December 1, 2016. Each parish or group of parishes will submit to the Bishop a plan which engages and promotes reconciliation and includes an implementation process by March 1, 2017. Parishes have begun their work on the Pastoral Priority of Reconciliation. In August, Bishop Gruss provided pastors with an action plan to accomplish the above goals. Have you noticed anything about reconciliation going on in your parish? Fr. Steve Biegler used his October 9 bulletin cover to call for a week of prayer for reconciliation in the cathedral parish from October 12-18. Many priests have reflected in their homilies on reconciliation in its various forms and among individuals and groups, as well as the Sacrament of Reconciliation. In his homily on October 23, Fr. Brian Lane reminded parishioners that a simple and effective Act of Contrition can be quoted directly from the Sunday Gospel reading: “O God, be merciful to me, a sinner” (Lk 18:13). Other homilies in the past few months have emphasized reconciliation within our personal relationships, between family members and within communities. To become a reconciling community, we might begin by carefully reading Chapter 9 of the Bishop’s pastoral letter. To go further, we can look at the Sunday readings and study them for God’s message of reconciliation. Parishes have been asked to host evenings of prayer and reflection on Reconciliation, to dream about what a reconciling parish would look like and to assess the availability of reconciliation and the need for further reconciliation in their parish communities. By December 1, pastors are to report that assessment to the Bishop. Then pastors and parish leaders will use the assessment and resources on reconciliation to make a parish reconciliation plan aimed at making each parish a reconciling parish, where forgiveness, healing and unity are promoted and nurtured. The plans are scheduled to be in place in parishes by March 1, 2017. Meanwhile, we as individuals can make our own assessment. Accept the challenge! Reflect on the questions included on page 84 in the pastoral letter, participate in our parish’s discussions on reconciliation, and share with our parish leadership our own thoughts, hopes and prayers for reconciliation. Visit and pray with our own family members about reconciliation. If the pastoral plan is merely a nice idea left tucked inside an attractive book on a shelf in the corner, it can accomplish nothing. However, if we give it the time and attention so that we know the plan and have internalized the vision and mission of the diocese, these mere words can shape all of the work that we do for the sake of the Gospel, and together we can “create” a healthy, vibrant diocese that will continue building the Kingdom of God for years to come” (p. 6). https://www.rapidcitydiocese.org/wp-content/uploads/2016/05/pp-logo.jpg 200 201 Becky Berreth https://www.rapidcitydiocese.org/wp-content/uploads/2016/07/FINALLogoDark.png Becky Berreth2016-11-15 15:52:592017-02-27 16:00:34The Diocesan Priority Plan — What is happening? WASHINGTON— Archbishop Joseph E. Kurtz of Louisville, Kentucky, president of the U.S. Conference of Catholic Bishops, has issued the following statement regarding last night’s election of Donald Trump as President-Elect. Full statement follows.